I spent all day yesterday sewing (and cleaning and laundry, but the sewing is the important part) BUT I can only show you one thing since the rest of what I was working on was prep-work for the QCQAL blocks for April! One week from today, the first 8" block tutorial will be posted, so don't forget to come back! The one thing that I worked ton that I can show you is my March Stash Bee block. Normally I try to be a good Hive Mama/Bee Mama and get my blocks done right away in the first week, but that did not happen at all this month! And this block took maybe a half hour to make! 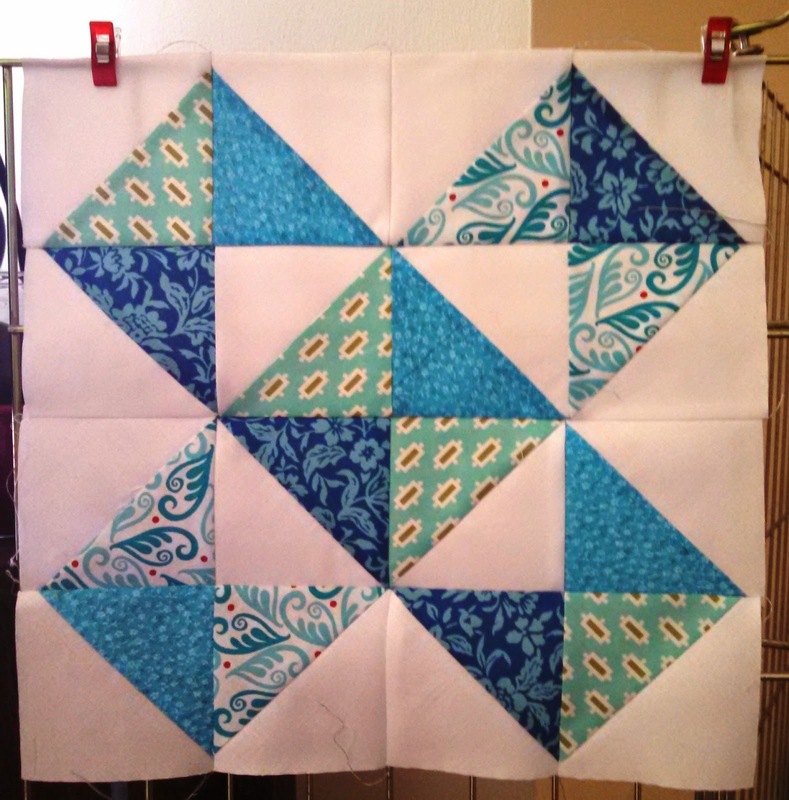 Robin requested aqua HST quilt blocks in any design that we desired! I made this block (which has a name but it escapes me at the moment) and it was so fast! For some reason, I have really used up a lot of my aqua scrappy stash recently (at least pieces big enough for this block) and I didn't have a lot of fabrics to work with! The last few baby quilts that I have made have all used the same simple layout and I put together a basic tutorial on it to share and share a little bit on the method behind my madness. I started making simple baby quilts with this setting because you can back the quilt with one single width of the snuggle flannel they sell at Joann, but any fabric wider than 40" will be wide enough to back this quilt with, since the quilt finishes at 39" square. I always found it rather annoying to have to piece a backing for such a tiny quilt, and then have so much left over -- this way the excess backing is reduced. This is also a great way to use some of those 12 inch blocks you might have left over from swaps or a great way to try out some new blocks! The first two examples above are blocks I made and/or received in swaps in 2014. The bottom one is one I made from a fat quarter bundle. 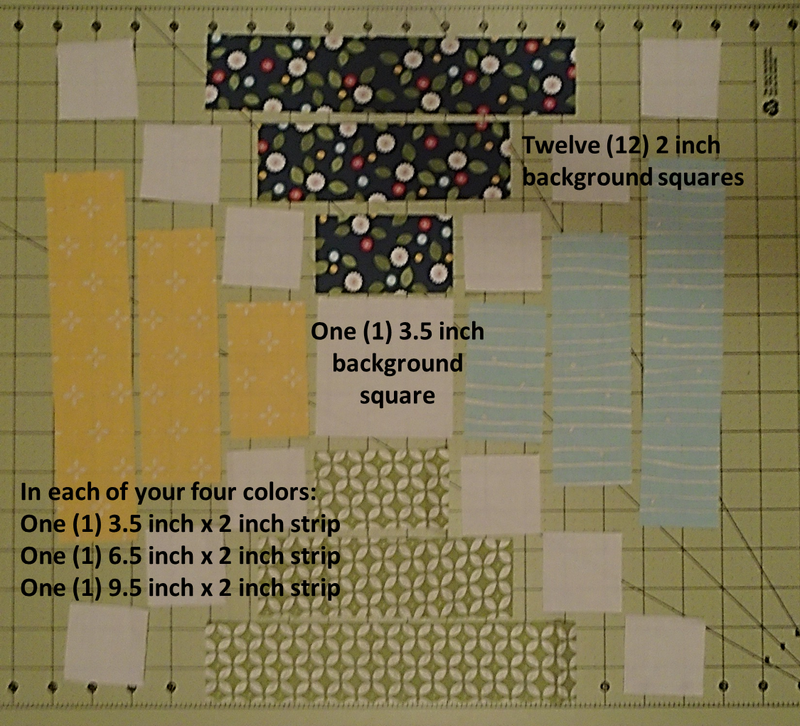 Lay out your nine quilt blocks as desired. Sew sashing strips to the sides of blocks to create three (3) rows with four (4) sashing strips and three (3) quilt blocks. Sew four (4) rows containing four (4) cornerstones and three (3) sashing strips each. Sew sashing rows to block rows to complete the quilt top. Quilt and bind as desired. That's it! Short and sweet! The second 12" block row for the QCQAL will be courthouse steps! Courthouse steps is a type of log cabin block and the block we'll be making has cornerstones in each block to integrate some background fabric in each block. As before the cutting diagram shows how to cut for one block and the directions below show the total cutting for a throw sized quilt and for a twin sized quilt. This one is especially easy to make in batches -- and there are no triangles at all! I've decided to make all of my blocks exactly the same, but will rotate them in the row to add interest. Decide which color will be at the top (for mine, the navy), right side (light blue), bottom (green), and left side (yellow) of each block. I made all of mine with the same color orientations, and turned them in the row. Sew your 3.5 x 2 inch top and bottom strips to your 3.5 inch background square. Press away from the center. Sew your Unit As to the sides of each unit. Press away from the center. Sew your 6.5 x 2 inch top and bottom strips to the sides of your center square. Press away from the center. Sew your Unit Bs to the sides of each unit. Press away from the center. Sew your 9.5 x 2 inch top and bottom strips to the sides of your center square. Press away from the center. Sew your Unit Cs to the sides of each unit. Press away from the center. And voila -- your block is complete! This last week has been kind of busy with work (both jobs! ), but I still managed to finish my "regular size" March wall hanging for at home and my "mini" wall hanging for at work. I posted on Instagram when I got all of the satin stitching done on last Thursday (snow day!) and then did the quilting and binding on Sunday. This was the first time that I used a single color for all of my satin stitching for one of these wall hangings and I am very happy with how it turned out. It definitely helps the birds, tree, and flowers jump out from the busy background. I did vary the width of the satin stitching in a few places because of how small some of the pieces were. Here's a close up of the birdhouse and I think this picture shows both the different widths of the satin stitching that I did and shows off the quilting. For the quilting I did an all-over pattern that started with a swirl and then I did two layers of flower petals around each swirl. I think it turned out very well and it wasn't too dense or too open. I think the little red birds might need some button eyes. Here's a close up of another one of the flowers and more of the quilting showing up well. I used a purple and yellow on creamy-white floral print for the binding to try to bring out some of the non-green/teal colors in the wall hanging. I used this old spool of purple variegated thread (unfortunately you can't really tell it is variegated in these pictures!) to do the top stitching on the front of the wall hanging using this herringbone-type decorative stitch. On the back I used the same green fabric for the back and the pockets. The fabric is one that I've had in my stash for a long while that I bought when Park Ranger Husband and I were visiting Ohio and I bought the end of this bolt. It's a very cute fabric but for a quilt shop fabric it's kind of on the flimsy side, hence why it's on the back of a wall hanging. Here's a shot of the quilting on the back and a closer up view of the backing fabric. And now onto my March mini! Forgive the semi-atrocious fluorescent lighting, I have no windows. I used all teal pieces for the backing on this one with lights in the middle and darker pieces around the outside (like basically all of these!) and I just put a bird and a birdhouse on it. I thought about doing a flower too, but I was worried it would look too busy. For the quilting, I used the "gridlines" created by the squares to use as a guide to do a simple clamshell quilting motif. If you look closely, you can see that the "dips" of one row line up with the seams, and the "dips" of the next row line up with the center of the block -- at least for the most part. it was a little harder to stay consistent in the middle where the birdhouse was, but I did my best to keep things evenly spaced and of the same approximate height. All in all -- a good new motif added to my arsenal. Not something I would do on something very large, but a fun accent motif, I think. Here's the back -- yes, I do hang it up with a pencil. This squiggly fabric is left over from my Beau's Ties quilt and I have a LOT Of it left over, so I'm probably going to be using it for a lot of wall hanging backings in the near future. I also bound this one with the same fabric -- the squiggle looks so good as a binding! 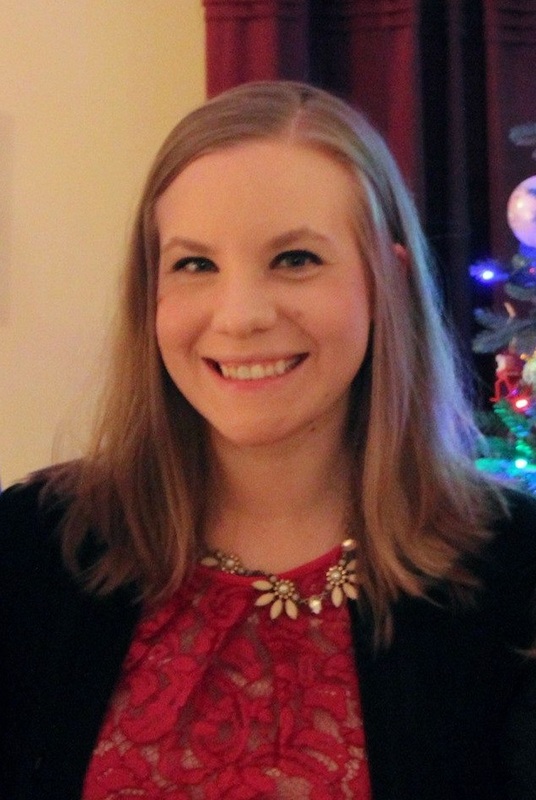 I'm linking up at the usual places -- free motion mavericks and finish it up friday! At both of my jobs, I have a co-worker having a baby boy in April. I decided that I would make similar quilts using fabric bundles I had on hand just to make things easier. I managed to get all of the blocks made on the last time that I had a snow day. I was able to get the whole thing sashed together that week as well. I took zero in progress pictures because I was all like OMG MUST MAKE AND FINISH FAST! And here's the whole quilt -- finished and bound! I actually hand stitched the binding to the back yesterday because we had another snow day. I haven't done one in a while and it was quite relaxing! I love this sock money fabric so much. I bought two fat quarter bundles in the "boy" colorway and two in the "girl" colorway. Basically every baby quilt I make for a long while is going to be this fabric. For the quilting, I used light blue thread because the fabrics had both white and a light tan, so white thread and off white thread looked funny against the fabrics. You can't hardly tell it's blue unless you look close, but I'm very happy with it. I did a larger bubbly meander for this one and had only a few thread issues which was a miracle! And there are zero puckers on the back. Small miracles! I bound it with a piece of brown on brown fabric that was the backing on another quilt (I forget which). My original intention was to turn one of the fat quarters into bias binding, but even though this quilt is 40 inches square, a fat quarter isn't big enough. Things you learn! The backing is brown snuggle flannel. I love the way that flannel makes a baby quilt so much more cuddly and soft. I also love how easy it is to FMQ with a flannel baking. Keep your eyes peeled for an upcoming tutorial on how to use any 12 inch blocks to make a 40" baby quilt so that you don't have to piece the backing! Like I mentioned above, the baby shower is actually today so I'm glad I got it finished up in time! Linking up with Finish it up Friday and Free Motion Mavericks!! 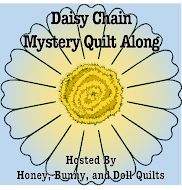 Welcome to the FIRST tutorial for our second Quilter's Choice Quilt Along! This week we have our first of two 12" block rows and this week we are making Weathervane blocks. This block is a classic. It can be found in the Farmer's Wife quilt, but more modern versions have taken it and added new life and fun to it. I've made my blocks (and subsequently, this tutorial) based off a three color version of this block that is similar to a more "traditional" Weathervane block. Click here to see a great tutorial for a more modern Weathervane. For a throw quilt, you will need to make a total of four (4) blocks. For a twin quilt, you will need to make a total of six (6) blocks. I am making a twin sized quilt so I decided to make three blocks each in two different sets of fabric. and alternate them in the row. Darling! The cutting diagram below shows how to cut for one (1) block. This way, if you want to do one block at a time (or make a scrappy block) you can easily cut one block at a time. The directions below the diagram list the total number of pieces for a throw quilt and then for a twin sized quilt. 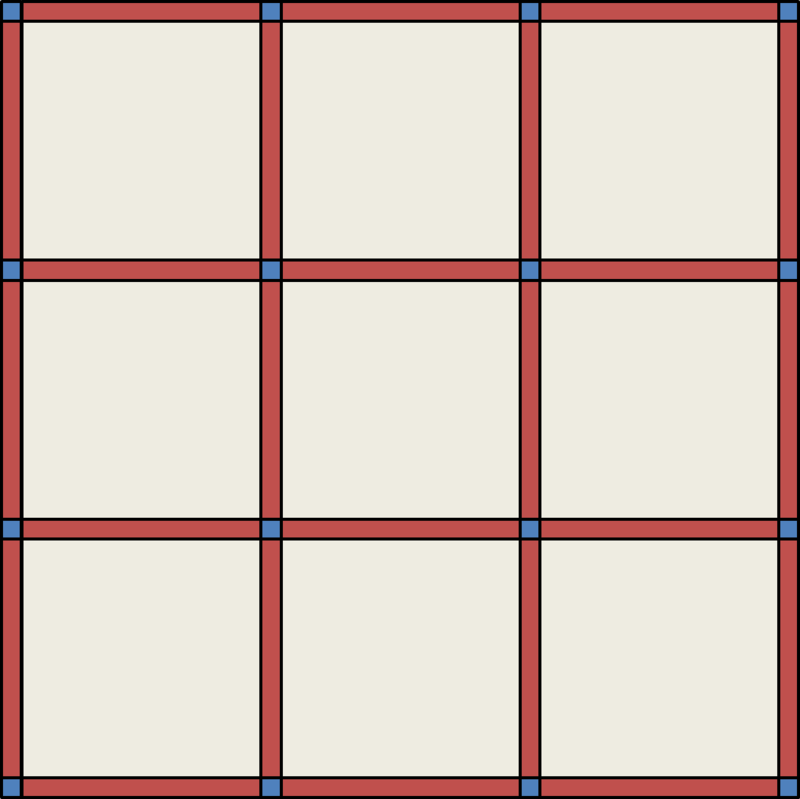 Draw diagonal lines on each of your 3 inch background squares. Pair with 3 inch focus fabric squares and sew on each side of the diagonal line. Cut apart along diagonal line, and press. Trim each square to 2.5 inches. You will need eight (8) HSTs per block. 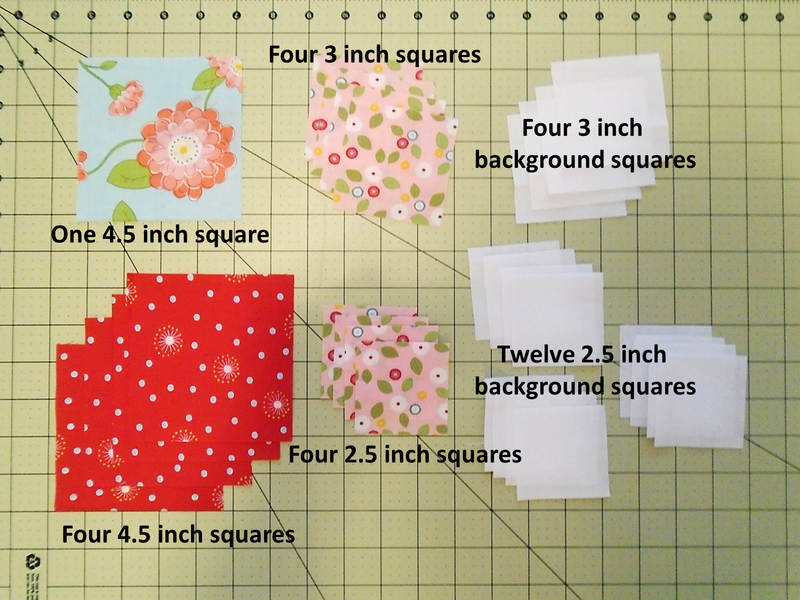 Lay out corner units as shown below and sew together like a four patch using your HSTs, focus fabric 2.5 inch squares, and 2.5 inch background squares. Make sure your HSTs are oriented correctly! You will need four (4) of these units per block. Using your remaining 2.5 inch squares to sew two stitch and flip corners on each of your 4.5 inch squares that will go along the sides of your block. Align each 2.5 inch square with the corner of the larger square and sew along the diagonal. Trim off the excess fabric 1/4 inch from the seam and press. Repeat on one adjacent corner. You will need four (4) of these units per block. 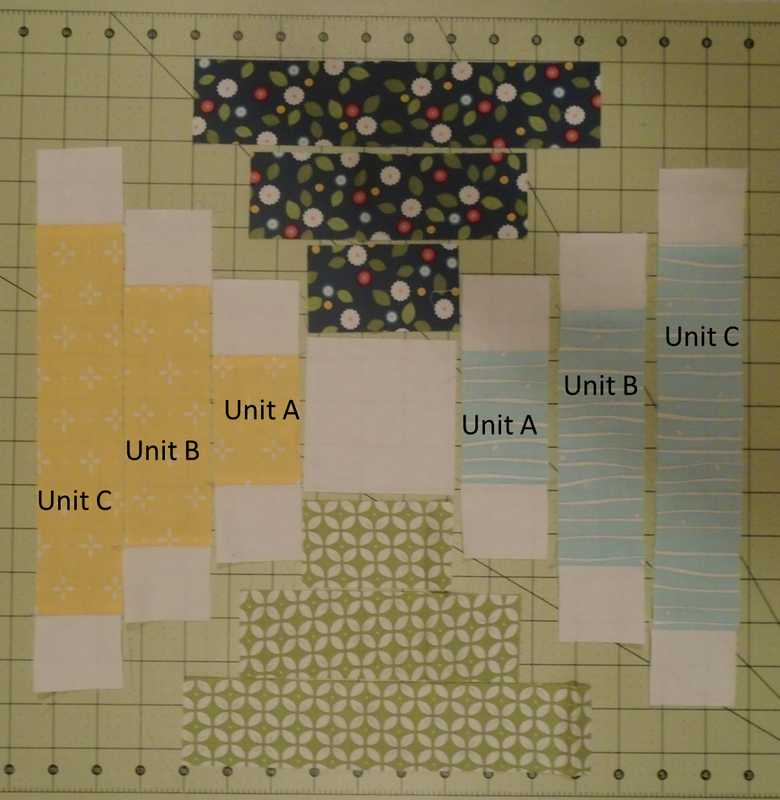 Lay out each of your blocks as shown below and sew together for your final block! Alrighty folks, you have two weeks to make either four or six blocks before the next row comes out! In two weeks, we will have our link-up for both rows 1 and 2.